Scientists came to this conclusion based on the analysis of sediments of the coastal lagoons of the island of Bonaire, located about 80 km North of Venezuela. It should be noted that the Caribbean is extremely susceptible to hurricanes, tsunamis, landslides and floods. 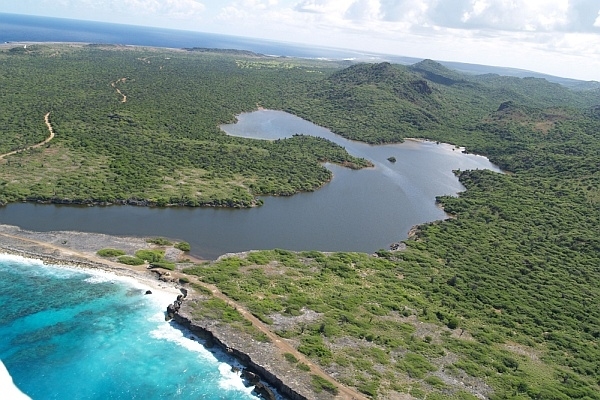 During 500 years of recorded history on Bonaire never had a tsunami, but the organic material in the sediments (the remains of animals, carbonate minerals) and other factors suggest that a huge wave hit the island 3-3,3 thousand years ago. Judging by the size of the stones which changed its location, Max Engel from Cologne University (Germany) and his colleagues believe that the height of the tsunami reached 8-9 M. Wave of at least 250 m inland. The lagoon and valley-flooded a mile and more, and flat and low-lying southern tip of the island could completely disappear under water. Disaster undoubtedly changed the coastal ecosystem and the nature of the distribution of sediment. Shortly after the big wave barrier of coral rubble separated Bay, once framed mangroves, from the open sea, making it extremely salty lagoon, which it remains to this day. It remains unclear, whence came the tsunami. The most probable source of researchers consider the earthquake on the southern border of the Caribbean plate, that is, on the coast of Venezuela. In historical Chronicles preserved mention of tsunami 1530, which was caused by a push near the Venezuelan city of Cumana. Cannot be disregarded, and the likelihood of earthquakes in the North-Eastern borders of the same plate. For example, in 1867 impetus in the Strait of Anegada in the East of the British virgin Islands has led to a tsunami that swept all of the Caribbean. Another reason could be the activity of submarine volcanoes in the southern part of the Antilles, though generated by these processes tsunami usually have local character. It is not excluded that it was "teletsunami", appeared on the other side of the Atlantic. According to Mr. Engel, computer models show that collapse in the sea slope of the Cumbre Vieja in the Canary Islands can cause a wave that will still be up to several meters in height, when crosses the Atlantic ocean and close to the Caribbean Islands and the southern coast of North America. In short, contrary to common perception, tsunami on Bonaire possible. Probably the same situation and with the other Islands. It's time to take action. The study is published in the journal of Sciences). Based on the materials of Our Amazing Planet. You are reading news На Карибах возможны сильнейшие цунами if You liked the article На Карибах возможны сильнейшие цунами, prokomentiruet her.